The Jawbone UP3 promised a lot but delivered a little. Although the UP3's aesthetics are something the competition can learn from, there are just too many sacrifices here. It doesn't offer a display or waterproofing, and the poorly designed clasp makes for an incredibly frustrating experience. If you're looking for something with similar functionality, you'll want to check out Jawbone's UP2 or look elsewhere. The Jawbone UP3 is one of the most attractive fitness trackers on the market right now, even though it’s over a year old. It’s thin, lightweight, and looks more like a piece of jewelry than anything — something most other fitness trackers can’t say for themselves. But we all know looks aren’t everything, which is why we still want to review the UP3. It’s price is getting lower and lower every day, but can it survive in a world filled with entry-level, affordable activity trackers? Find out this, and more, in our Jawbone UP3 review. Review notes: I’ve been using the Jawbone UP3 as my main fitness tracker for the past two weeks, though I’ve been using it intermittently for roughly three months. The Nexus 6P has been my smartphone companion of choice for the duration of this review. It’s not a stretch to say that the UP3 is a good-looking device. In my opinion it doesn’t come with any eyesores or anything that really makes it look like a fitness tracker. It’s comprised mostly of a premium rubber material that’s plenty durable and comfortable on the skin. The top of the device — the part that carries all the internals — is made of plastic. Our particular unit has a ridged pattern on the top, though other models with different textures are available, as well. Unfortunately that’s where the positives end for the UP3 in the design department. On the inside of the device you’ll notice five little gold spikes. These are the bioimpedance sensors that will keep track of your heart rate. The placement of these sensors is what makes the UP3 so uncomfortable to wear, though. They dig right into the skin and often leave marks, as you can see below. During the review period, I was constantly adjusting the placement of the tracker on my wrist in hopes to make it a little more comfortable. No matter if I was wearing it closer to my hand or further away from it, I just couldn’t find a comfortable position. It would have been nice if Jawbone included an optical heart rate sensor, like you’d find on the Fitbit Charge HR or Blaze. We’ll talk more on this later, but I can’t help but think an optical HR monitor would make the device much more comfortable to wear everyday. The awkward clasp mechanism Jawbone implemented here isn’t very good, either. No matter where I wore it on my wrist or how tight I was wearing it, I found the UP3 falling off multiple times per day. This is obviously not something you want to see on a fitness tracker, but unfortunately that’s the case here, at least with my unit. And most of the time I wouldn’t even be exercising and it would fall off. Whether I was wearing it at the grocery store, cleaning the apartment, going for a run or sleeping, I just couldn’t get this thing to stay on my wrist. As you’ve probably already noticed, there’s also no display on the UP3. There are only three little LED-lit icons that tell you which mode you’re in. This means that if you want to see how many steps you’ve taken for the day, when your next alarm will go off, or anything else, you’ll need to fire up the UP app and wait for your tracker to sync. The usual bevy of fitness tracking metrics are offered by the UP3. It will track your steps taken, distance traveled, calories burned and even your sleep. I compared the UP3’s fitness tracking results with my Fitbit Alta and Withings Activité Steel, and all three trackers seemed to give me similar results in terms of step, distance and calorie tracking. Since there’s no display on the UP3, you won’t need to manually select a start workout now button when you plan to start your exercise. All of your workouts are recorded automatically in the UP app, which works most of the time. Oftentimes I’d find the UP3 would record my workouts to be a little shorter than they actually were. So if I went on a 40-minute run, for instance, the device would sometimes record it as a 34-minute workout or even less than that. You can always edit your workouts in the UP app after the fact, but that’s not really ideal. On a positive note, the UP3 will remind you to move if you’re inactive for any time between 15 minutes and 2 hours. You can also set times where this feature is turned off, so it won’t annoy you when you’re trying to relax at the end of the day. This is a small feature, but one I found to be quite handy. Sleep tracking is also present here, and it’s one of the tracker’s main features I didn’t have a ton of problems with. The UP3 can record your light sleep, deep sleep and awake times throughout the night, and I’ve found the results to be accurate. It also comes with a cool feature called Smart Alarm that will wake you up at just the right moment in your sleep cycle. Smart Alarm is also one of those little features I really loved about the UP3. This is unfortunately another area where that horrible clasp mechanism comes into play. Remember when I told you the UP3 would fall off at the grocery store and basically everywhere else? Yeah, that doesn’t get much better during sleep. A lot of the time I’d wake up and the UP3 would be lying next to me or unclasped but still on my wrist. Plus, since it’s so uncomfortable to wear because of those bioimpedance sensors, it was tough to forget I was wearing it when I went to bed. Heart rate tracking on the UP3 is sort of a disappointment. Since it doesn’t come with an optical heart rate sensor, the bioimpedance contacts will only measure your resting heart rate and passive heart rate. This means it will collect your HR data throughout the day and store it within the app, but you won’t be able to manually choose when it records this data. So if you’re working out, just went for a long walk or are simply sitting around, you won’t get real-time HR stats, which is arguably what most people want out of a fitness tracker with a built-in heart rate sensor. That’s not to say resting heart rate data isn’t necessary or useful — it is, and very much so. Resting heart rate data will help you determine how factors such as caffeine, stress and more affect your heart each day. But when Jawbone originally claimed the UP3 was the “world’s most advanced fitness tracker”, I thought it would bring a little more to the table than what it currently offers. All in all, the heart rate readings I was given were mostly accurate. 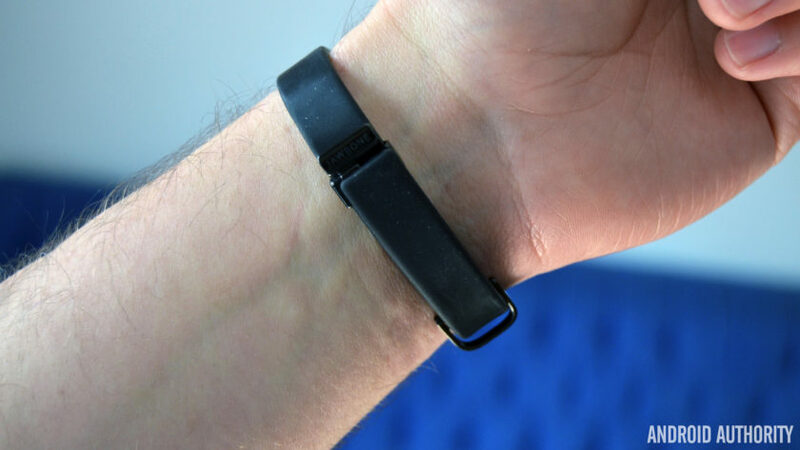 It wasn’t too far off from what the Charge HR or Blaze would give me, and that seems to be the case with most other wrist-mounted fitness trackers out there. We should also talk about what’s perhaps the most controversial part of the UP3: waterproofing. Well, lack thereof, actually. Jawbone delayed the launch of the UP3 for 6 full months because it couldn’t figure out how to waterproof the device properly. The UP3 eventually shipped out to consumers, but it was water-resistant, not waterproof. This means you can wear it in the rain and you don’t need to worry about sweat or getting it wet in the shower. You do, however, need to take it off before jumping in the pool or relaxing in the sauna. One other no-so-bad part of the UP3 is its battery life. Jawbone says it will last 7 days on a single charge, and I’ve been able to achieve just that, if not more. It’s sort of a pain to charge the device, though. You don’t really have to plug the device into anything, per se, but you do have to sit it awkwardly on the induction USB charger just right otherwise it won’t charge. Jawbone’s UP app isn’t necessarily the most intuitive thing out there, but it does a good job at displaying your most important information at the forefront. It not only gives you standard step, calorie and distance information, but also tips and tricks on how to achieve your next round of goals. It also hooks up to a large number of other apps like MyFitnessPal, IFTTT, Runtastic, and even other devices like the Nest Thermostat and Withings Scale. No, you should not buy the Jawbone UP3. It’s not the best or cheapest fitness tracker on the market… not even close. It’s clasp is poorly designed, it isn’t comfortable, it’s not waterproof, and doesn’t have a display. So what does it do well? It can handle step and sleep tracking well enough (when it manages to stay on your wrist), and it looks good. You also don’t really need to worry about charging it too often. That isn’t a recipe for a successful product, though. If you absolutely need a Jawbone device with similar functionality, you can always check out the UP2. It has a better clasp, it’s cheaper, and comes with all the same features aside from heart rate monitoring. I was really looking forward to the Jawbone UP3. But even with it’s sub-$100 price point, I can’t recommend this product to anybody. Note: You may have noticed the Jawbone UP3’s overall score is much lower than what was determined by our standard rating system. Since the battery scored so well and brought up the end score, we decided to override the total score and bring it down to a number we saw fit.